If you want to try something a little different for St. Patricks Day, I highly recommend this riff on the traditional corned beef and cabbage. The colcannon is a mixture of cabbage, mashed potatoes and bacon. If you are lucky you can find authentic bangers which are British pork sausages. They got their name because they are said to make a bang sound when they split while cooking. But the star of this dish is the brown sugar and Guinness Stout gravy. The sausages are cooked in the beer and then the beer and brown sugar are thickened with a butter and flour mixture. The taste is excellent with both the sausages and the potato, cabbage mash. Unfortunately, I did not put much of the gravy on my plate when I photographed it. I corrected that mistake when I dug into it. As far as I know the original recipe came from Tara at Smells Like Home. You can visit her site to see a better picture of the dish with the gravy. If you can’t find bangers, any mild sausage will do. I used an Italian turkey sausage. The dish is garnished with scallion tops. It is well worth a celebration. 1. In a 12″ sauté pan, brown bangers on all sides over medium heat. Add beer to pan, reduce to a simmer. Braise bangers until they are fully cooked and the beer reduces by half, about 10 minutes. 2. Remove bangers from the pan and whisk in brown sugar, butter/flour mixture, and salt until the mixture is smooth. Bring gravy to a gentle boil and reduce to a simmer until thickened. If the gravy thickens too much, add 1-2 tbsp of chicken stock as needed. 1. Place potatoes in a medium saucepan and cover with cold water. Add 1 1/2 tsp Kosher salt and bring to a boil over medium-high heat. Boil until potatoes are fork tender, about 10-12 minutes. Drain and keep warm in the saucepan you boiled them in. 2. While the bangers brown and potatoes boil, cook bacon in a 12″ skillet over medium heat until almost crisp, rendering as much bacon fat in the pan as you can. Add 2 tbsp butter, allow to melt, and then add the cabbage. Sauté mixture until cabbage is almost tender but a slight amount of crunch remains, about 10-15 minutes while stirring occasionally. Great picture Penny! This sounds really good! 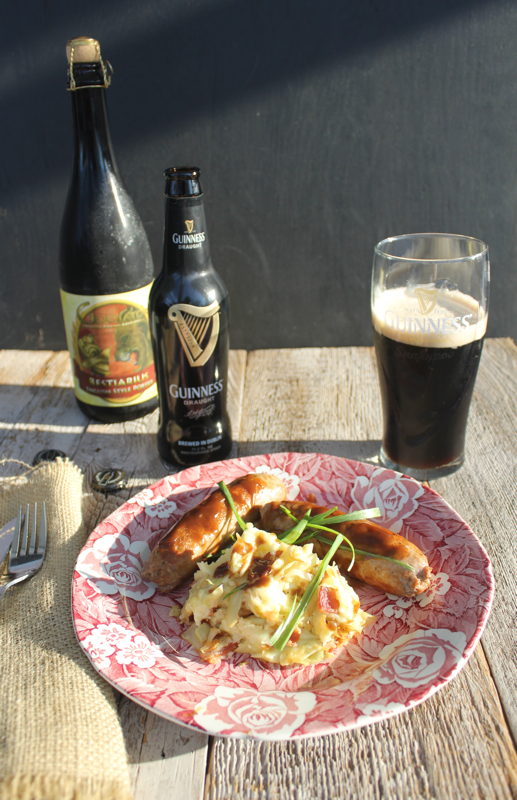 I’ve made brats in beer, but never thought of using Guinness. Will definitely try this next time I make sausage. Adding brown sugar? Genius! This sounds great, Penny! 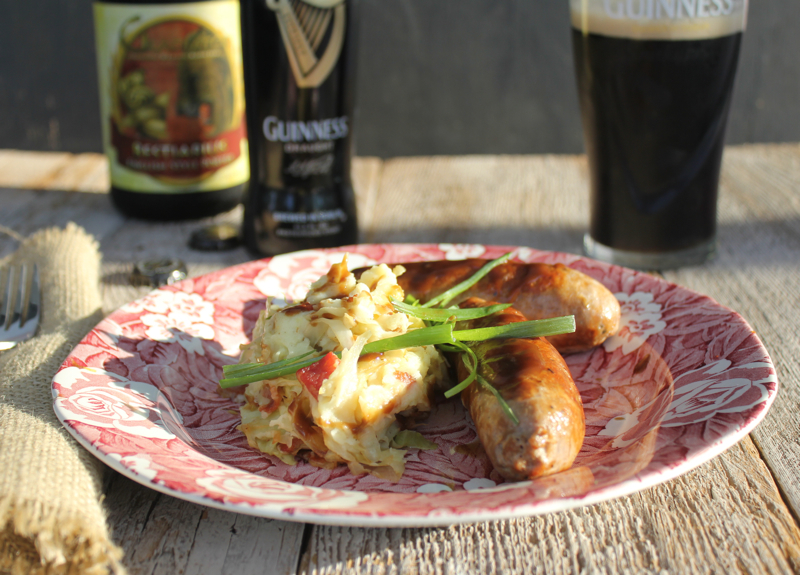 I love colcannon and I think pairing it with bangers and a tasty gravy would be fun…I love using Guinness in cooking, it adds such a nice layer of flavor!! I like the gravy idea and anything made with Guinness must be good – I laid in a few the other day for the big day. I too like the gravy idea. Happy St. Patty’s Day Penny. I think you’ve picked the perfect meal. Can’t wait to try this. Looks amazing. We are in EI for the weekend. Taking the grandkids to the St. Patrick’s day festival tomorrow. Ate at the Chef and the Farmer last evening. Food was wonderful, as always! Finally able to comment! I tried visiting using Firefox several times which had really messed up your page – no comment box. Tried using Google Chrome today and it worked! Love your ‘bangers’ and mash. I cook bratwurst in beer so know I would love these with the potato and cabbage mash. The gravy sounds delicious too. I’ll have to try this version the next time I make this dish. 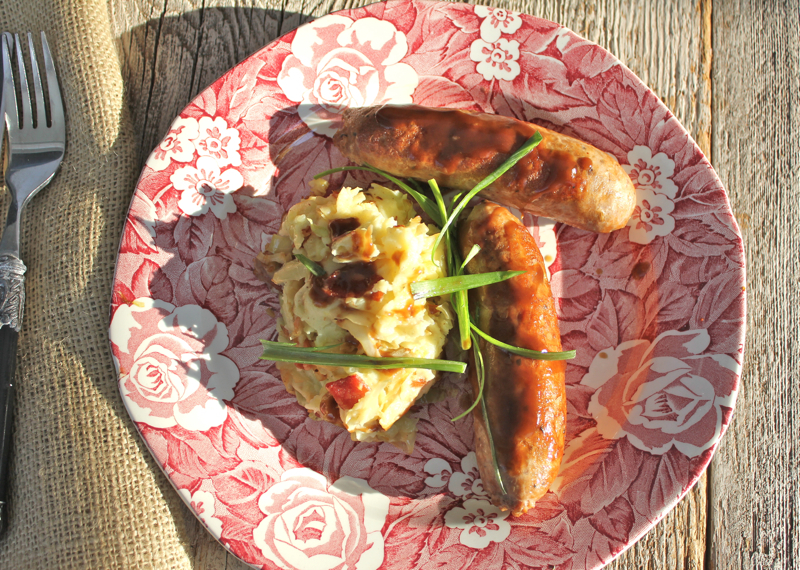 Your can’t beat bangers and colcannon for a satisfying meal. I could chow down on colcannon every day! My, that plate looks sooooo good, Penny. The gravy sounds interesting too…never have made anything like it. That bit of sweet would be marvelous on bangers. Happy St. Paddy’s Day, Penny! I just love colcannon Penny. I don’t know why I never think of it until St. Paddys Day. I have even read that it is also traditional to use kale so I must give that a go sometime. This post was published by Penny on March 13, 2014.